Edward J. Katz is professor of literature and language and dean of university programs at the University of North Carolina at Asheville. He was a member of an advance team at the 2003 SENCER Summer Institute and led full teams to both the 2004 and 2006 Institutes. Prior to taking his current position in UNCA’s Office of Academic Affairs, Katz led the revision of the university’s general education program: the new curriculum?entitled Integrative Liberal Studies?was approved in spring 2004 and has since been fully implemented. 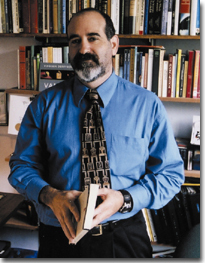 He is the recipient of UNCA’s Distinguished Teacher Award for Untenured Faculty (1995), the Distinguished Teacher Award in the Humanities (1999-2000) and the University Distinguished Teacher Award (2003-2004). In 2005, the Association of General and Liberal Studies awarded Katz the Jerry G. Gaff Faculty Award for contributions to teaching and leadership in liberal education. He sits on the board of directors of CAGLS (the Council for the Administration of General and Liberal Studies). He is also a senior fellow for the National Center for Science and Civic Engagement. Katz’s interests include general education reform, curriculum development, and integrative approaches to the liberal arts.